The registered mail service for the above philatelic products will be available on the issuing date at the above locations. The selling price for one set of stamps is 10.00 patacas, the first day cover with set of stamps (FDC) is 14.00 patacas, the first day cover with souvenir sheet (FDC/SS) is 14.00 patacas, the information brochure with set of stamps is 14.50 patacas and the information brochure with souvenir sheet is 14.50 patacas. The stamp designer for this issue is Victor Hugo Marreiros, and the text for the information brochure is written by Ms. Tereza Sena, Research Fellow of Macau Ricci Institute. This is the 11th issue and the last issue in 2006. The issued stamps are as “Lunar Year of the Dog” on 09/01/2006; “Charming Chinese Lanterns” on 12/02/2006; “Scenes of Daily Life in the Past III” on 01/03/2006; “Museums and their Collections II – Communications Museum” on 18/05/2006; “2006 FIFA World Cup GermanyTM” on 09/06/2006; “Designs of Fans – Kam Hang” on 28/06/2006; “XXI China Adolescents Science and Technology Invention Contest” on 28/07/2006; “Streets of Macao” on 13/09/2006; “25th Anniversary of the University of Macau” on 28/09/2006 and “I Ching, Pa Kua V” on 09/10/2006. The Macao Post announced that the selling price of the “Philatelic Album with Luxury Slip Case”, available for sale at the Philatelic Shop of Macao Post Headquarters and the Communications Museum, will be adjusted to MOP250.00 starting from 30th November, 2006. Macao Post will issue a set of five postcards on 30th November 2006, it will be available for sale at the Macao Post Headquarters, all post offices and postal kiosks. The picture with scenery watercolor painting comes from the Macao painter, Mr. Lai Ieng, which includes his masterworks of “The Taipa Houses – Museum”, “Senado Square”, “Monte Fort in Ancient Serenity”, “Greenscapes of Lou Lim Ieoc Garden” and “Guia Lighthouse”. A full set of 5 postcards are packed in an exquisite cover, the title written on the cover “Charming Sceneries in Macao and Taipa” is dedicated by the Macao columnist, Mr. Lao Wah (Dong Chuan Xuan). The selling price for one set of five postcards is MOP28.00. Through this set of postcards, messages can be send to every corner of the world together with promoting Macao’s famous landscapes to the foreigners. To celebrate the 7th Anniversary of the Establishment of the Macao Special Administrative Region, Macao Post announced that a Temporary Post Counter will be set up at our Philatelic Shop located at Macao Post Headquarters at 9H00 to 17H30 on 20th December 2006 providing the commemorative cancellation service for the “7th Anniversary of the Establishment of the Macao Special Administrative Region”. To celebrate the Overseas Chinese World Conference for Promoting Peaceful Reunification of China 2006, Macao Post announced that a Temporary Post Counter will be set up at the Exhibition Center of the Macao East Asian Games Dome on 14th and 15th December 2006 with the cancellation theme “Overseas Chinese World Conference for Promoting Peaceful Reunification of China 2006 (Macao, China)”. The Macao Post announced that 18 automatic stamp vending machines located at different areas in Macao (please refer to appendix for details) will be started using the reprint label stamp “Environmental Protection” from 9:00a.m. on 1st December, 2006. The mentioned automatic stamp vending machines will be gradually installed the reprint label stamp from 4:00p.m. on 30th November, 2006. The relevant machines will be temporarily suspending the service. Sorry for any inconvenience this may cause. The label stamp “Environmental Protection” was issued on 5th June, 2002. The reprint label stamp maintains the original design, but with the wording (REIMP 2006) indicating the reprint year at the bottom of the empty selvage. M acao Post would like to inform that an official website http://www.macaupost.gov.mo has been launching since November 1st, 2006, providing a new service of online payment for Annual Philatelic Subscription. Starting from now on, our Annual Philatelic Plan Subscribers may enjoy the benefits of this new channel of our subscription and online payment besides the existing ones at Post offices counters or by mail. This new service provides a convenient and fast way to get information about Macao Philately and make philatelic subscription anytime, anywhere. Macao Post invites the public to visit the above-mentioned website and welcomes all to join in the Annual Subscription. 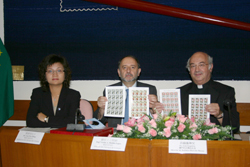 Macao Post has issued a new design of Christmas Card with theme “Our Lady of Immaculate Conception” on 17th November 2006, it is available for sale at the Macao Post Headquarters, all post offices and postal kiosks. This card priced at MOP7.00 can be sent to every corner of the world. No stamp is required, it saves your time and money.